Annual Holiday Open House at the Carnegie Museum! Kids at the Carnegie is Roseville Historical Society's newest program with a goal of getting children involved in history! The inaugural event will be held on Saturday, December 1 from 10am - noon. We will take a look at what holidays were like in years past, have a story time, do some arts/crafts, and more! Please note - parents must stay for duration of event. A $3 donation per child is requested on day of event. 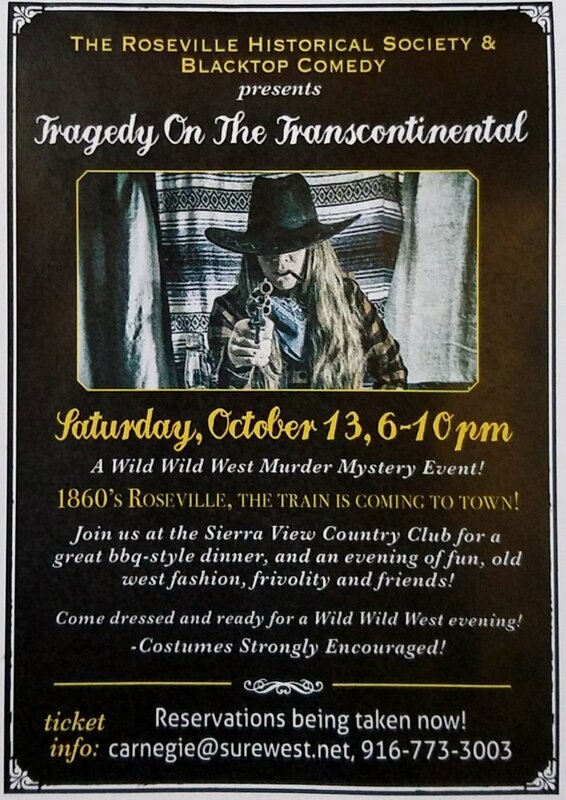 An 1869 Roseville murder mystery event! As Roseville citizens gather to celebrate the completion of the Transcontinental Railroad it turns out to be a night of secrets, lies, and..... murder!!! Not everyone or everything is as it seems. Join us for a Wild Wild West evening with the cast of Blacktop Comedy. It will be an unforgettable interactive theater experience involving a sheriff, bartenders, preachers, railroad tycoons... And you! We'll see you in 1869 Roseville! Be sure to dress accordingly! Costumes are strongly encouraged! $1,000: table of 8, includes BBQ dinner and show. No host bar. Logo display on all event materials, on the Historical Society website and any press coverage of the event. You will also be included in the printed information about the Historic Fiddyment Property restoration efforts. It's a great way to show your support of our cultural heritage! $75/each ticket. Includes BBQ dinner and show. No host bar. Please indicate your choice of tablemates if applicable! This is the Roseville Historical Society's annual fundraising event. No refunds please. This year's proceeds will be utilized towards the renovation of the Historic Fiddyment Property. We appreciate your support!